Identity theft has become a significant crime in today’s society. It can take various forms, including complete use of an another individual’s personal information as one’s own, use of a credit card for unauthorized purchases, or use of someone else’s Medicare ID number or health insurance number to obtain services or bill for services never provided. Thieves can obtain the personal information needed to commit these crimes by simple techniques such as looking through trash, taking mail from a mailbox, or stealing a purse or wallet, to more involved schemes such as hacking into a personal computer, using medical or business records, or operating telephone/internet/door-to-door scams. 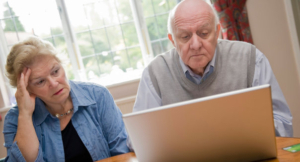 While identity theft can affect people of all ages, seniors may be especially vulnerable due to a number of factors. In general, they are a lower risk for creditors because they carry less debt than younger adults and have paid off previous loans. In addition, they have higher wealth and credit limits, and are less likely to check their credit reports. Therefore, thieves who use a senior’s information are more likely to have an application for a fraudulent loan or credit card approved. Scammers will prey upon seniors who are lonely, and present themselves as friendly and sympathetic people who only want to “help”, thereby gaining the senior’s trust. Greater utilization of medical services can place personal information at risk just because it is available to a greater number of employees of health care providers. Unfortunately, family situations may also create increased vulnerability for identity theft if a relative becomes desperate for cash due to a gambling or drug addiction, long-term unemployment, divorce, or some other crisis. Identity theft among seniors may be an even larger problem than we currently suspect, because seniors are sometimes reluctant to report it. They may not fully understand what has happened, or they may feel shame or embarrassment about something they did which “allowed” it to happen. If a family member has perpetrated the crime, the senior may feel guilty about turning the person in to face consequences. Additionally, seniors who are victims of identity theft may fear that others will be view them as incapable of managing their own affairs, causing them to lose financial control and independence. The potential signs of identity theft are numerous. Bank/credit card statements may arrive late or contain errors/unauthorized transactions. You may not be approved for a loan or receive a job offer as expected. Bills for products or services never ordered may be received, as well as collection calls for debts that aren’t yours. Inaccurate information on a health insurance explanation of benefits form or credit report may be present. Businesses may not accept a personal check as payment for goods or services. If you experience any of these events, it is important to investigate as soon as possible. When identity theft has occurred, certain steps can be taken to mitigate the effects of the theft. There are three main credit reporting companies: Equifax (800-525-6285), Experian (888-397-3742) and TransUnion (800-680-7289). Calling any one of these companies to request that a fraud alert be placed on your account will trigger notification of the other two. The initial fraud alert will remain in effect for 90 days. In addition, copies of a personal credit report should be ordered from each one and carefully reviewed for accuracy. If errors are found, contact the company immediately. Finally, an Identity Theft Report should be created. This report is comprised of two parts, an FTC Affidavit (a written complaint created by the Federal Trade Commission when you report the incident), and a police report (filed by taking your FTC Affidavit to a local police department). To report identity theft to the FTC, call 877-438-4338, or visit their site online at www.ftc.gov/complaint. One can avoid the hassle and potentially devastating effects of identity theft by taking steps to protect personal information. Do not give out personal information online, by telephone, or in person unless you have initiated the contact. Check your credit reports regularly. Federal law entitles you to one free credit report every 12 months from each of the three credit reporting agencies (they don’t have to be at the same time). Visit www.annualcreditreport.com or call 877-322-8228. Do not keep your passwords in a file on your computer. Utilize passwords that mix letters, numbers, and special characters. Check your credit cards bills and bank statements when they arrive. If you shop online, use websites which are secure. A site that uses encryption to protect your personal information has “https” at the beginning of the web address. The “s” is for secure. Do not carry your social security card or Medicare card with you unless you specifically need it. Instead, keep it in a secure location at home. Drop off mail at the post office instead of placing it in your mailbox. Utilize anti-virus and firewall software on your computer. For seniors who may be vulnerable to telephone scams, the National Consumers League has a Five Step process for helping seniors identify potentially fraudulent calls. Visit the website www.fraud.org and search for “They Can’t Hang Up”.